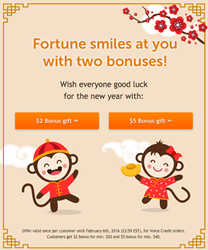 DianhuaChina.com announces a special Chinese New Year offer: $2 or $5 bonus on Voice Credit orders placed until February 6th. Between 4-6 February, Voice Credit orders will be rewarded with two special gifts, so that Chinese people can be chattier and happier this year. These days Chinese people all over the world are getting ready for celebration. The Chinese New Year is fast approaching and together with it the feeling of rebirth and new beginnings. In addition to these favorable changes, DianhuaChina.com gives Chinese people two extra reasons to celebrate: two calling bonuses for longer international calls. This special promotion is available for all DianhuaChina.com customers who want to get free calling credit. Between 4-6 February, Voice Credit orders will be rewarded with two special gifts, so that Chinese people can be chattier and happier this year. In order to get the $2 bonus, customers need to place a Voice Credit order of at least $20 and use coupon code MON2KEY in the ordering process. If customers want to receive the $5 bonus, they should place a Voice Credit order of at least $40 and use coupon code MON5KEY. any smartphone, as DianhuaChina.com offers a free app, for both iOS and Android devices, called KeepCalling. Voice Credit is a prepaid service offering affordable credit for international calls and SMS. The rate for international calls to China is 1.1¢/min for both landlines and mobiles, while the cost of an SMS is 14¢. In addition to Voice Credit, DianhuaChina.com also offers Mobile Recharge and Monthly Plans. Mobile Recharge is a service through which customers can recharge phones anywhere in the world. The process is fast and secure and the credit reaches its destination instantly. With over 300 operators from more than 100 countries, DianhuaChina.com can satisfy every need of international mobile recharge. The operators available for top ups to China are China Mobile, China Unicom, and China Telecom. Monthly plans are monthly subscriptions which offer discounted rates for frequent calls to both landlines and mobiles in China. The plans available on DianhuaChina.com are China 300 for $2.88/month and China Unlimited for $5.28/month. Customers are happy both with the quality and with the prices offered by KeepCalling.com. On Trustpilot, a famous review site, KeepCalling.com receives constant feedback from its customers and currently has an 8.5 rating. One customer writes, ’Excellent service. I have been using this service for 3 years, have never had any problems, very dependable. No hidden fees, minutes never expire over time. Website easy to understand, easy to reload minutes’. DianhuaChina.com is an interactive website designed by KeepCalling, a global telecommunications company registered in 2002 in USA. Presently, KeepCalling provides its services to hundreds of thousands of consumers and businesses worldwide, with a focus on customer satisfaction. KeepCalling has been listed by Inc 5000 as one of the fastest growing companies in the USA for 5 consecutive years. In 2015 the company registered a revenue increase of over 200% from 2011 to 2014.